Who knew the 30 year old, oft-maligned, red-headed stepdaughter of financial products would be front and center last Sunday night at the Academy Awards? 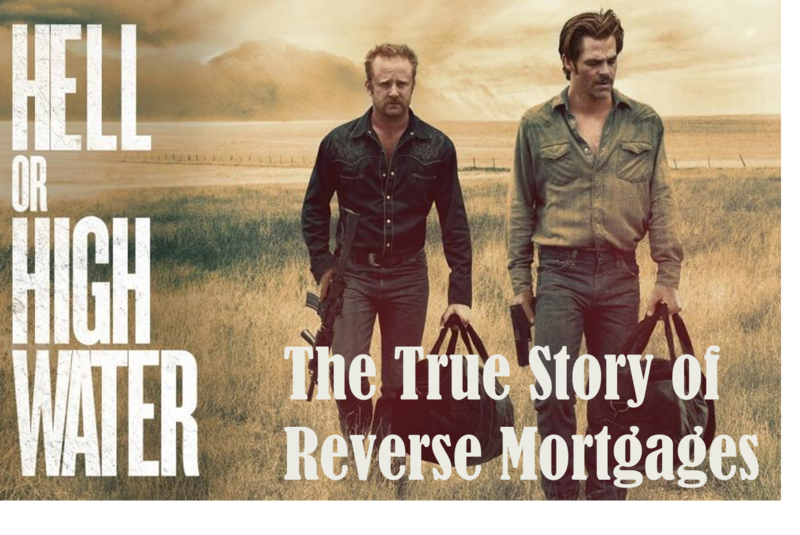 Nominated for four Oscars in the 89th Academy Awards, Hell or High Water follows the journey of two brothers who set out on a bank-robbing spree to pay off their late mother’s reverse mortgage lien. The film was on the ballot for Best Picture, Best Original Screenplay, Best Supporting Actor for costar Jeff Bridges, and Best Film Editing. To help borrowers meet the tax requirement, new Federal Housing Authority guidelines single out borrowers who have had hiccups with paying taxes in the past and demand a Life Expectancy Set Aside (LESA) to ensure that the borrower will be able to pay their taxes throughout the term of the loan, which helps minimize the risk of foreclosure. The LESA, in essence, sets aside the taxes and insurances and requires the lender to pay them and removes that responsibility from the borrower. The LESA is only one example of the many consumer protections the FHA has built into the new reverse mortgage. Another bit the movie doesn’t exactly highlight is information on when a reverse mortgage loan must be repaid. In the movie, the loan goes into repayment once Jeff Bridges’ mother passes away. While in real life the family has six months to repay the loan and with extensions that can increase to one year. While the deceased mother would have been well-aware of that, it seems as though she forgot to fill her sons in on that information, leaving them no chance to prepare for the repayment. The family can obtain traditional financing to pay off the loan, use insurance proceeds or go on a bank robbing spree etc. If the loan balance is more than the home is worth, the heirs/estate can do a Deed in Lieu of Foreclosure if the family just wants to walk away or they can redeem the home for 95% of current market value.What financial challenge did momma have that she needed the money? A challenge or risk to any of the 4 L’s is enough to prompt a retiree to utilize a reverse mortgage to supplement their retirement income. The movie fails to tell the story of which of these retirement income goals Jeff Bridges’ mother was able to meet by utilizing the reverse mortgage. Apart from knowing WHY momma did the loan to begin with, we are hard pressed to determine whether the decision was prudent or not. Where were Toby and Tanner Howard when momma needed them the most? Did Toby and Tanner Howard do enough for their mother during retirement to help her enjoy a successful retirement? Knowing that the sons were willing to go on a bank-robbing spree after they found out they owe the bank $43,000, one could imagine they would have been willing to go above and beyond for their mother before she passed. Reverse mortgages often get shone in negative light when referring to how the loan could affect the heirs, but even for last-resort borrowers, there are myriad strategies that can be utilized by borrowers and their heirs to mitigate any potential risks associated with the reverse mortgage. Today’s reverse mortgage is a powerful financial strategy designed to be integrated with a retiree’s other assets as part of a comprehensive financial plan. A plan to can help create cash flow, preserve assets and ensure liquidity throughout retirement. In times past, there have certainly been bad reverse mortgage actors in the form of loan originators and lenders, and bad actions taken on part of consumer, including frivolous and careless spending. However, when used correctly, today’s reverse mortgage is a powerful and viable retirement enhancement resource. And when done correctly the kids will never have to go on a bank robbing spree to save the farm. Great feedback. Sadly, people take what is presented in movies and television programs as the gospel. Your note helps those of us who haven’t seen the movie, understand some illustrative errors. This helps us get out front with some of our clients.